It’s already been a few years since Hellboy died fighting to quite literally save the world and we’re still mourning for him. 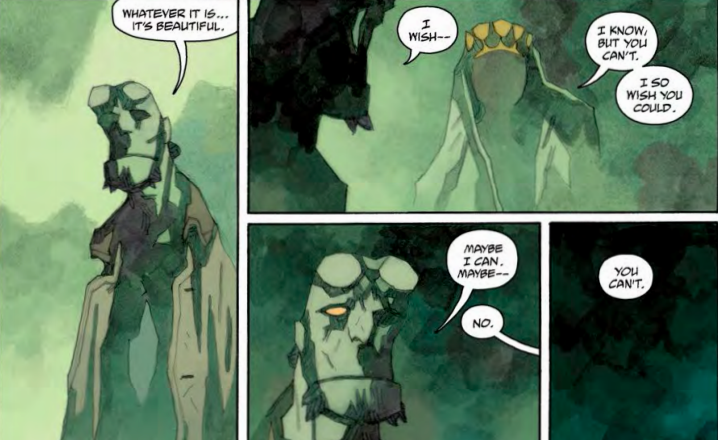 And there’s now been seven issues of Hellboy in Hell but the tone of Mignola’s storytelling has shifted so drastically now that we’re spending time with a dead character who’s being told that even in Hell he still needs to fight the good fight. Sent to Hell after his death, Mike Mignola’s character has been even more distant and lost than he ever has before. And when he’s told by two spirits or demons that he’s gravely ill, he asks “How does that work? I’m already dead. How much worse can I get?” Well, it seems the answer is that it can get gravely worse. Mike Mignola is working up to something in Hellboy in Hell but he’s taking his time getting there. In a sick-bed vision of a new England, revitalized after his last Earthly battle, he sees a giant tree growing where he had his heart plucked out of his body and he’s told of a new world that’s being born out of his blood. It’s a vision that he’s told he’ll never be able to really experience and it’s just heartbreaking to see what this great character has become. Mignola created him as this loud, boisterous character. He was Jack Kirby’s The Thing as a monster hunter. How cool and awesome is that? The answer is very. And now he’s quite literally a spirit, a ghost that’s haunting a Hell that still continues to use and manipulate him. He may be dead but it’s looking like he will never be free. If freedom is something Hellboy will never experience, he gets pulled into a battle between two other spirits. In Hell, he has been pulled into all of these power struggles, positioned as a force to be used without having any apparent stakes in these battles. It says a lot that the character feels like he’s stumbling from bad situation to bad situation in this series, unable to break any cycle. We’ve been told before by other characters who tried to use Hellboy when he was alive that he was to be the next demonic ruler of the world, that he was going to bring Hell to Earth and sit on the throne with a fiery crown. And now that he’s in Hell? Is he ruling anything? Is he sitting on a throne? If anything, he’s just a vagrant, trapped, alone and lost. Even as he’s put upon and used in all of these power struggles, he has the weight of fate on him and it’s marvelous to see Mignola draw that. That cover alone has to be one of the saddest Hellboy images ever put to paper and many of the runner up drawings are in this very issue. Small, grey and oh so thin, Hellboy is just a shell of the man he used to be. Mignola and colorist Dave Stewart masterfully depict the deathly sickness of the character. And even diminished as he is, Hellboy is the calm center of the storm that is Hell. The world he now lives in is pure chaos and he’s the personification of stillness in it. Of course, that perceived calmness may be more resignation about his circumstances but it says a lot about his situation that he’s not the ball of energy that he was when he was alive and fighting demons on Earth. Mignola shows him as a sickly spirit who has resigned himself to the idea that he’s never going to get better and that gives the book a melancholy and slightly fatalistic tone. Hellboy In Hell #7 shows just how far Mignola, Hellboy and we have come in the last 21 year since Hellboy #1 was published in 1994. 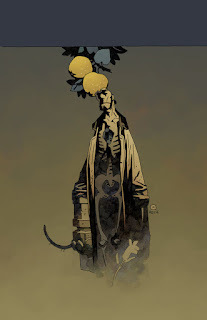 Mignola’s story has become this strange creature of death, regret and manipulation but each issue is a wonderful joy of the struggle of a character who has discovered a destiny so different than any he was prophesied or coerced into. It’s this sublime story that’s so different than almost everything that has come before it. And this latest issue is just so bloody tragic that you feel as small and grey as Hellboy is.